of Hayes, Middlesex. Telephone: Southall 2468. 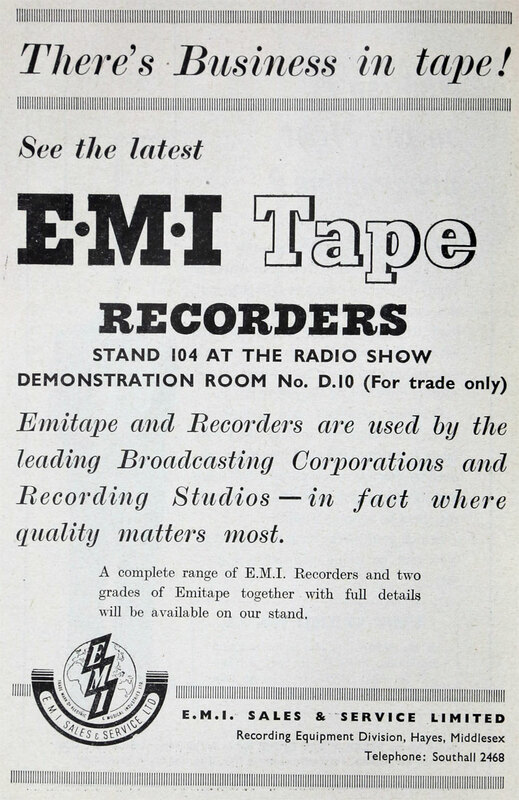 Cables: "Emifactory, Hayes, Middlesex"
1931 The Electric and Musical Industries Ltd formed in March 1931 as a public company from a merger of the UK Columbia Graphophone Co and the Gramophone Co and others. 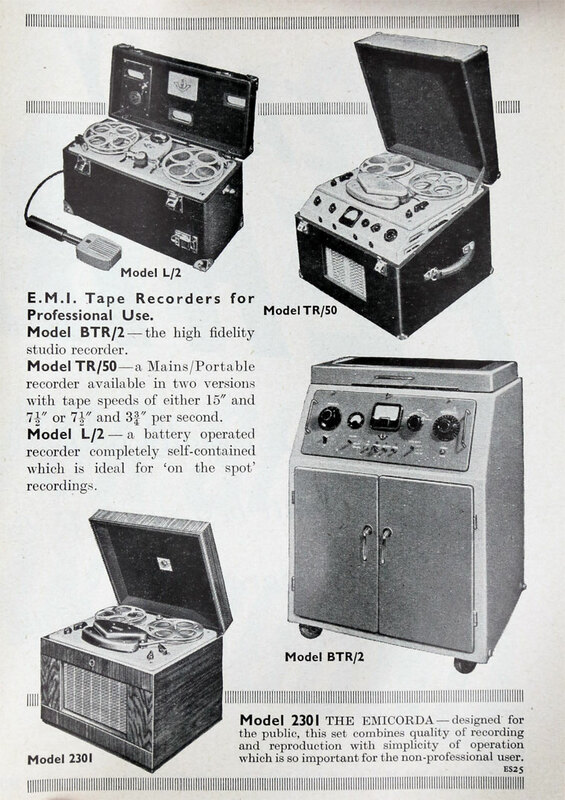 From its beginning, the company was involved in both the manufacture of recording and playback equipment and the provision of music to play on its machines. The company's gramophone manufacturing led to forty years of success with larger-scale electronics. 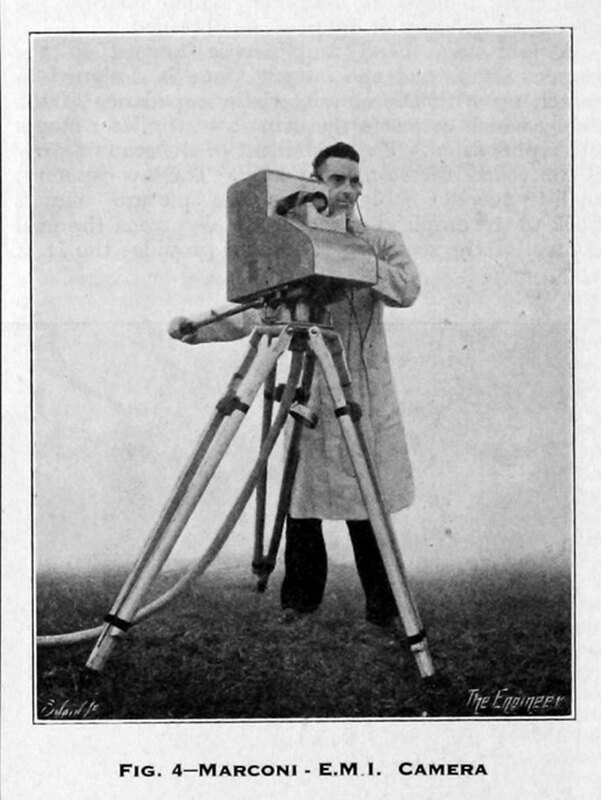 During and after the World War II, the EMI Laboratories in Hayes, Hillingdon developed radar equipment and guided missiles. 1934 Marconi's television transmission interests were merged with those of EMI Ltd in a company called Marconi-EMI Television Co which would be concerned with all aspects of transmission. 1934 Rudge-Whitworth, the largest Coventry cycle concern, was taken over by the Gramophone Company. WWII: started production of special types of thermionic valves. 1945 With Smiths Motor Accessories Ltd Gramophone Co formed a joint company Radiomobile Ltd to market car radios developed and manufactured by the Gramophone Co.
1946 Reorganisation of EMI's companies. As a result, the Gramophone Co's research, design and production activities were distributed between 3 of EMI's subsidiaries. 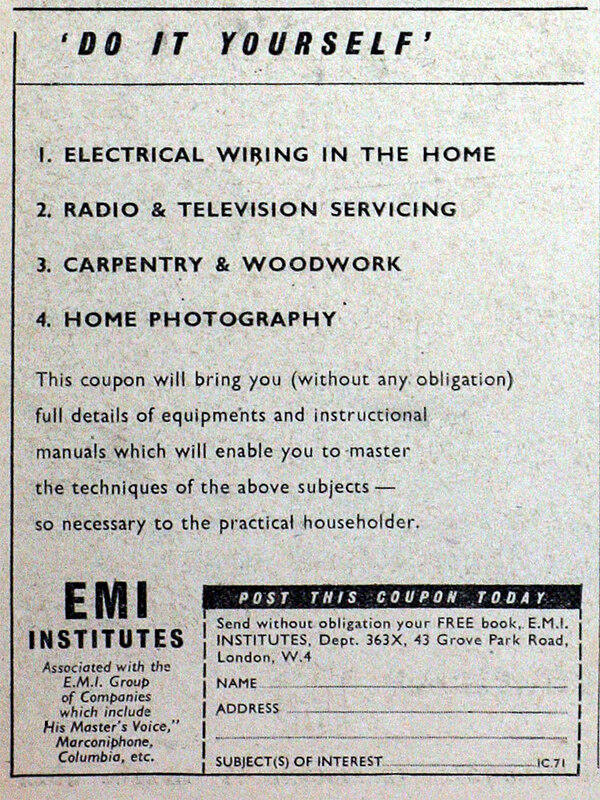 1947 EMI purchased a large factory at Perivale from Radio and Television Trust. 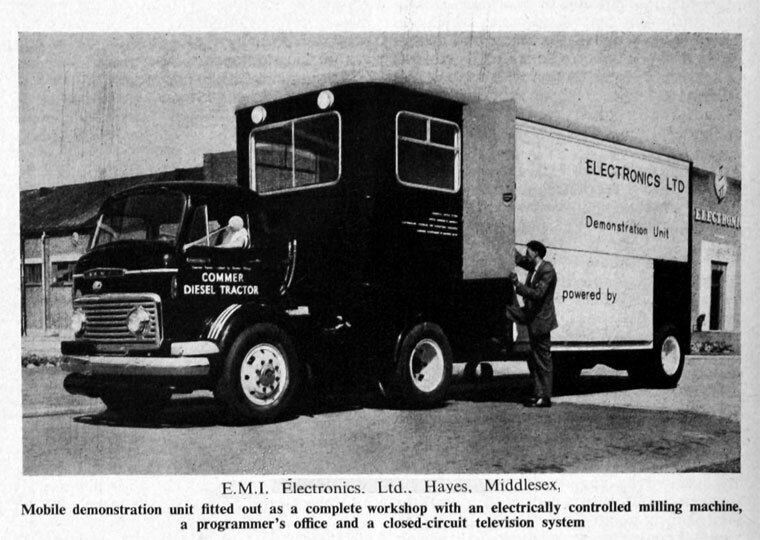 1949 EMI acquired control of Cossor's Electronic Tubes thermionic valve production subsidiary which continued to supply A. C. Cossor. 1950s Thorn Electrical Industries took over the manufacture of the HMV and Marconiphone range of consumer products from EMI. 1956 GEC purchased EMI's share in the M-O Valve company which had been held through the Gramophone Co.
1955-7 The EMI Electronic Business Machine was developed at Hayes; this was a valve-based computer which was ordered by BMC for payroll work; valves were then recognised as being too unreliable and future computer development was based on transistors. 1958 the EMIDEC 1100, Britain's first transistorized computer, was developed at Hayes under the leadership of Godfrey Hounsfield. The company won a contract from NRDC to develop a transistor-based computer, which came to fruition as the EMIDEC 2400. 1960 EMI bid for Simon-Carves but was unsuccessful. 1968 GEC and EMI merged their domestic appliance businesses, British Domestic Appliances and GEC (Domestic Equipment) producing the largest refrigerator maker in the UK and major share in washing machines, cookers and small electrical appliances, which was then called British Domestic Appliances. 1969 Acquired Associated Fire Alarms, followed shortly thereafer by Minerva Fire Defence. Early 1970s, the EMI scientist developed the first CAT scanner, a device which revolutionized medical imaging. Hounsfield later won the Nobel Prize for his accomplishment. After brief but brilliant success in the imaging field, EMI's manufacturing activities declined and disappeared. 1973 GEC acquired EMI's share of British Domestic Appliances. 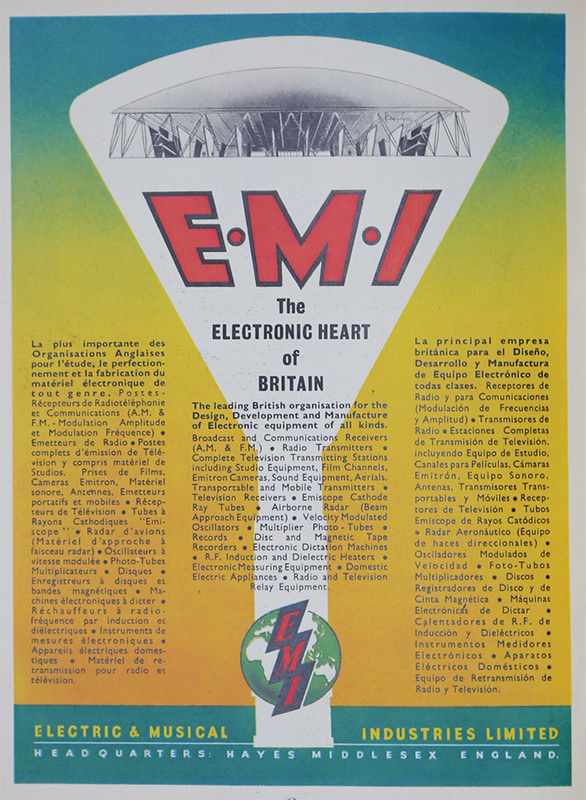 1979 EMI was acquired by Thorn Electrical Industries to form Thorn EMI one of the largest operating companies in the UK. This page was last edited on 28 October 2018, at 15:51.